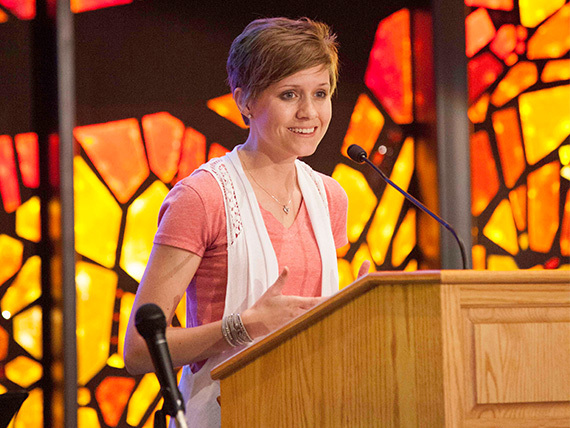 The 2015 Women in Ministry Conference, hosted by Hardin-Simmons University, Logsdon Seminary and Texas Baptists, was held on Friday, February 20, 2015. The Ninth Annual conference drew women and men alike, from across the state to help encourage, equip for ministry and support exploration of women leadership roles in a variety of contexts. Meredith Stone, instructor of Christian ministry and director of ministry guidance, along with Dr. Bob Ellis, associate dean and professor of Old Testament of Logsdon Seminary, organized this year's event for more than 180 people from as far as Houston, San Antonio and Corpus Christi. The theme, "Reflecting God's Image," was designed to explore what it means to be created in the image of God and reflect the divine image through the act of ministry. "By acknowledging God's image within us and also within others, we are able to collaboratively join with one another and with God in the important work of ministry," said Stone. The conference included plenary sessions, panel discussions and breakouts on topics related to women in ministry and ministry equipping. Dr. Ellis, who was instrumental in the planning of the conference, spoke about its importance, "Women enrich our ministries and have gifts that are powerful and unique. It is our mission to prepare those whom God has called." The speakers throughout the conference resonated the theme and applied its principles to the whole minister - woman or man. In her sermon during the morning plenary session, Cheryl Kimble, Pastor of Highland Park Baptist Church of Austin, said, "We are to be reflecting the image of Christ, to be imitators not impersonators. We live our faith in our everyday lives, be who you are but imitate Christ, love others, accept others, embrace others and allow others to be who they are also." Jack Bodenhamer, Pastor of First Baptist Church, Elm Mott, also challenged the group to embrace their individual calls. "When God calls you, you say 'yes,' and when you are told to do something you say 'yes,' male or female," he said. "Yes Lord, here we are without dividing lines." The culmination of the conference was a final plenary session with Kyndall Rothaus, Pastor of Covenant Baptist Church in San Antonio. Her message encouraged all in attendance to "Be you. Spend your life being you. Spend your time doing the work you were called to do and don't look back. To minister out of the image of God means we embrace who we are, male and female," said Rothaus. Cheryl Sawyers serves as Director of Public Relations for Hardin-Simmons University.